Supernatural returns after a long hiatus and picks up right where we left off with Sam in Lucifer’s cage being encouraged to say yes to possession. This story takes up the bulk of the episode and rightly so because it was great. Mark Pellegrino is incredible as Lucifer so seeing more of him chewing the scenery with his unique mannerisms is always welcome. The angle he takes to convince Sam to say yes is an interesting one despite the familiarity of it. Trips through memory lane are all too common on this show but here it works really well. Lucifer takes Sam back to one of the memories he has of when he was younger to show him how dynamic and assertive he used to be. In this case the example is being confident with a girl but it serves as a good template for the version of Sam that Lucifer likes. After this Lucifer shows him the confrontation that lead to his imprisonment in the first place and points out that the version of Sam he admires was able to defeat him but as far as he’s concerned that Sam no longer exists. I like that he uses the mistakes Sam has made ever since that point in an attempt to break his spirit and force him to say yes. It’s a reminder of a time when Sam and Dean we’re entirely co-dependent and had the interests of others at heart. This is something that the show has moved away from since then so having Lucifer actively acknowledge that is a good move. Even better is that Sam remains strong and defiant by showing a complete lack of fear when faced with Lucifer’s threats. He knows that Lucifer would never actually kill him and isn’t concerned about the pain that will surely be inflicted on him. Knowing that he can beat Lucifer by simply refusing to cooperate is enough for him to continue to defy him. Lucifer tells Sam that he isn’t strong enough to defeat Amara as he isn’t prepared to watch people that he cares for die. As fights go it’s a pretty ugly one and will just get uglier but Lucifer doesn’t feel that Sam is up to the challenge. Lucifer defeated her before with help and is confident he can repeat the feat on his own. I suspect Dean’s connection with her is the key to winning this but I don’t think Lucifer knows about that quite yet. It’s interesting that Sam thinks having Lucifer and Amara sharing a planet can only be a bad thing. If he manages to defeat her then they will have Lucifer to contend with. He is just as bad if not worse and if he is the one who defeated Amara then the problem starts all over again. I got a real kick out of Lucifer’s comment about going to L.A. to solve crimes. It’s clearly a dig at the TV show Lucifer. Castiel’s encounter with Ambriel (Valerie Tian) at the site of the Angel’s attempt to smite Amara was refreshing as Cas’ encounters with Angels are almost exclusively really violent and result in the death of the other Angel. She is different as she doesn’t want to kill him. She is there to confirm Amara’s death and running into Cas is just something that happens outside of her mission. Lucifer and Santa combined – hello nightmares! Ambriel is a memorable character despite how short lived she is as she gives Castiel plenty to think about. I like how casual she is around him and that she is completely unimpressed despite his reputation. Pointing out that he’s as expendable as she is really gets to him. She tells him that he’s essentially the lackey of the Winchesters while they are the heroes. As far as she’s concerned their deaths won’t matter at all but that’s fine by her. Cas seems to have some kind of inflated sense of his own importance judging by how much this knowledge shocks him. Amara reinforces Castiel’s unimportance when she doesn’t even consider consuming his essence to be worth the effort. That has to be a knock to the confidence and it makes complete sense that he would be the one to say yes to Lucifer to give him some value. It’s worth noting that Amara is temporarily out of commission after the devastating attack by the Angels. She isn’t down for long but she isn’t invincible so that gives hope to the situation. Misha Collins does a good job of copying Mark Pellegrino’s mannerisms. Having Cas as Lucifer’s new vessel is an interesting development and I look forward to seeing what is done with the idea. My prediction is that there will be some existential head talking so that Mark Pellegrino can stay in the show. I hope this is the case as I don’t want that version of Lucifer to disappear. Dean doesn’t really have much to do in this episode but he really doesn’t need to. He finds his way to hell and helps Crowley control Rowena as well as reaffirming the Reaper desire to make sure the Winchesters stay dead the next time it happens. It was Sam’s party this week so Dean simply being there in the background was enough and didn’t leave the episode feeling overstuffed. I can’t put into words how glad I am that Lucifer killed Rowena so casually. She has done nothing but irritate me since her introduction and I was so tired of the constant back and forth between her and Crowley. She probably won’t really be dead but I hope she is. Their interactions in this episode were a reminder of how tiresome they are together. The festive imagery at the start of the episode involving Lucifer dressed as Santa as a way to foreshadow Rowena’s end was genius. 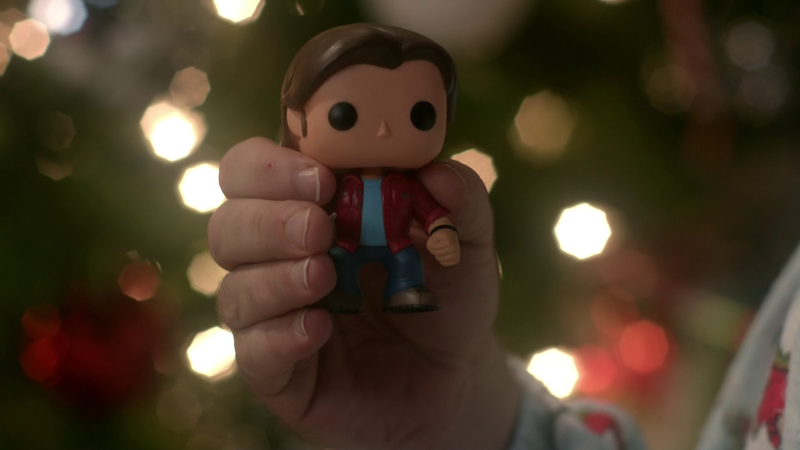 If anyone wants to send me a Sam Pop Vinyl then feel free by the way. An excellent return for this show that allows Mark Pellegrino plenty of opportunity to chew scenery as only he can. Lucifer taking Sam through different memories as a way to convince him to say yes was really well done. He makes it clear that he once respected Sam and then stopped after the point where he was strong enough to defeat him. It is a clever way to address how the show has made Sam and Dean very co-dependent at the expense of saving lives. Sam remains strong and defiant by showing a complete lack of fear when faced with Lucifer’s threats. Knowing that Lucifer can be defeated by simply refusing to cooperate is enough for him to find the strength to keep defying him. Lucifer points out that Sam isn’t strong enough to defeat Amara as he isn’t prepared to watch people that he cares for die. It’s a pretty ugly fight and will just get uglier but Lucifer doesn’t feel that Sam is up to the challenge. Lucifer defeated her before with help and is positive that he can do so again. My theory is that Dean’s connection with her is the key to winning this but I doubt Lucifer even knows about that. It’s interesting that Sam thinks that having Lucifer around will make things worse. If he defeats Amara then he will have to be dealt with and the idea of taking on the being that managed to defeat her isn’t an attractive prospect. Castiel’s encounter with Ambriel was refreshing as his encounters with Angels are usually a lot more violent and result in the death of the other Angel. She is only there to confirm Amara’s death and isn’t really interested in him. She give him plenty to think about by pointing out that he is as expendable as she is. Amara confirms this by telling him he’s not even worth the effort it would take to consume him. It makes complete sense that he would say yes to Lucifer considering all of this. Misha Collins does a great job of copying Mark Pellegrino’s mannerisms. Cas being Lucifer’s new vessel is an interesting development and I look forward to seeing it play out. I suspect there will be some existential head talking so that Mark Pellegrino will stay in the show. Dean doesn’t have much to do in the episode but since it’s Sam’s story he doesn’t need to. He helps Crowley control Rowena and reaffirms the Reaper desire to ensure that the Winchesters stay dead the next time they are killed. Having him in the background keeps him around without the episode feeling overstuffed. I’m glad that Rowena was killed by Lucifer so casually. I don’t like the character and was tired of the back and forth between her and Crowley as repeated in this episode. The festive imagery at the start to foreshadow her nasty end was genius.